The first football club in Malaga was stablished in 1904, with the formation of Málaga Foot-Ball Club. It was nothing more than a society intended to promote football, a new sport in the city, carried from the United Kingdom. Its first rivals were small teams formed by crew of foreign ships arriving to local harbour. In 1907, further attempts of popularising football were performed by Málaga FC. 1912 saw the arrival of a rival club FC Malagueño, and the establishment of a great rivalry with Málaga FC, which had merged with other minor clubs like Málaga Racing. In 1927, Málaga FC became Real Málaga FC after they were granted royal patronage by Alfonso XIII. During the 1929–30 season both of Real Málaga FC and FC Malagueño clubs became founder members of the Tercera División. In late 1930, Real Málaga FC, were reformed as Málaga Sport Club. In 1933 Málaga SC and FC Malagueño merged to become Club Deportivo Malacitano, although it wasn't a real merging at all, but a naming change of FC Malagueño, which had a good economic wealth and a better squad than Málaga SC. By this operation, CD Malacitano was able to heir the squad of FC Malagueño, having their contracts being cancelled in the other way. In 1934 this new club made its debut in the Segunda División when the division was expanded from ten teams to twenty four. After various seasons in Segunda División, with the competition interrupted because of the Spanish Civil War. In 1941 the club changed their name to Club Deportivo Málaga, as new stadium, La Rosaleda, was also inaugurated. In 1949, Málaga promoted for the first time to La Liga after several seasons in Segunda División and a couple in the third level. With chairman Miguel Navarro Nogueroles and coach Luís Urquiri, the club managed to promote in the last play of the 1948–49 season, in second position after leader Real Sociedad, and thanks to positive goal difference with Granada CF. Notable striker Pedro Bazán, who had previously scored 9 goals in a sole match against Hércules CF, was the top goal scorer and also one of the most important players of the team. In this first run in La Liga, Málaga stayed there two consecutive seasons, with notable former player Ricardo Zamora as coach of the team, and until the first relegation of the club at the end of 1950–51 season, lacking just one point to maintain status. In the subsequent seasons, Málaga achieved two new promotions to La Liga in 1951–52 and 1953–54, being relegated after just one year in both. 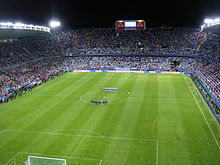 The 1952–53 season was notable because of a resounding 6–0 thrashing of Real Madrid at La Rosaleda, the major result up to date of Málaga against this club. After several new fleeting first level promotions in the 1960s, which turned out in immediate relegations, Málaga promoted once again in 1969–70 under the command of chairman Antonio Rodríguez López and coach Jenő Kálmár, to start a five-year top flight stay. However, president in charge Antonio Rodríguez López was brutally murdered because of Mafia issues in the year 1971, and was replaced by Rafael Serrano Carvajal forin the next season. With notable players like Miguel Ramos Vargas "Migueli", Sebastian Viberti, Juan Antonio Deusto and José Díaz Macías, the club achieved two seven league places in 1971–72 and 1973–74 (best results of the club up to date), a Ricardo Zamora Trophy in 1971–72 season performed by goalkeeper Deusto, and a 1972–1973 run of the club in the Spanish Cup, where they were dumped out in the semifinals by Athletic Bilbao. They also notably scored a victory on Camp Nou for the first time after winning to FC Barcelona at the end of the 1971–72 season. The club also established in 1973 an official anthem, Málaga La Bombonera, and from that moment the song is still the official anthem of the club. After a polemic exit of Viberti of the club at the end of 1973–74 season, the so-called golden years ended with a new relegation to the second level in 1974–75. In 1992, CD Malaga dissolved after financial difficulties. A former reserve club of CD Málaga, founded on May 25, 1948, named Club Atlético Malagueño after CD Málaga took over a junior club, CD Santo Tomás, with the purpose of establishing a reserve team, took over as Malaga's main team. Club Atlético Malagueño and CD Málaga had found themselves together in the 1959–60 Tercera División after CD Málaga was relegated at the end of the 1958–59 Segunda División. As a reserve team, the former should had been relegated to regional competition. To avoid this, they separated from their parent club and registered as an independent club within the Royal Spanish Football Federation. That move made it possible for the CA Malagueño to survive after CD Malaga suspended operations. The 1992–93 season saw CA Malagueño playing in Tercera División Group 9. After a successful campaign, the club was promoted to Segunda División B. The following season, however, the club was relegated again and, facing financial difficulties, were in danger of folding. On December 19, 1993, in a referendum, the club's members voted in favour of changing names and, on June 29, 1994, CA Malagueño changed their name to Málaga Club de Fútbol S.A.D. In the early 2000s, Málaga were a club rich in youth and top quality players, and boasted a more modern and developed stadium. Although they never pushed for a Champions League place, Málaga were always successful under the popular Joaquín Peiró. They made a solitary appearance in the UEFA Intertoto Cup in 2002, clinching their only official trophy by beating Gent, Willem II and an improving Villarreal. Málaga's run in the UEFA Cup was something of an overachievement, and ended in a defeat on penalties in the quarter-finals to Boavista, after beating Željezničar Sarajevo (who had been eliminated from the Champions League by Newcastle United), Amica Wronki, Leeds United (after a 2–1 win at Elland Road, courtesy of two Julio Dely Valdés goals) and AEK Athens. After Peiró's retirement, a mass exodus slowly started. Darío Silva, Kiki Musampa, Dely Valdés and Pedro Contreras all left the club. Juande Ramos took over as coach and oversaw a 5–1 home thrashing of Barcelona, the club's biggest victory against the Catalan giants, with a hat-trick from loanee Salva Ballesta, who would end up missing out on the Pichichi Trophy by just two goals. Ramos, however, left for Sevilla and Gregorio Manzano took charge. Despite steering Málaga to their second consecutive tenth-placed finish, Manzano could not prevent a lacklustre side from being relegated, and they finished bottom of the league with a paltry 24 points to their name. Málaga began the new second division season well. However, their form dipped dramatically and for two of the remaining six weeks were in the relegation zone. Málaga managed to address this situation and survived their first Segunda season. The 2007–08 Segunda División also began impressively, with seven straight victories. Málaga seemed to be on track for promotion but, after another slump in form, they were overtaken as leaders by Numancia. They needed a victory in their final game, at home to Tenerife, to assure promotion. Two goals from Antonio Hidalgo secured a 2–1 triumph and Málaga returned to the top flight as runners-up. Due to the club's economic problems, then-president Fernando Sanz found investments at Doha in Qatar to launch an ambitious project, entering in conversations with sheikh Abdullah ben Nasser Al Thani. On 11 June 2010, after a week of negotiations, Al Thani became the entity's new owner, being named president on 28 July in the members' meeting. On 28 June 2010, Jesualdo Ferreira was appointed as coach and Moayad Shatat was appointed as vice president and general manager. Following this was the signing of prominent players like Salomón Rondón and Eliseu. In November, however, Jesualdo was fired because he had not obtained the desired performance, positioning the club in the relegation places. Later, Shatat confirmed Manuel Pellegrini as coach. With "the caretaker" in charge, it was decided to discard players of the squad and strengthen with players like centre back Martín Demichelis and midfielder Júlio Baptista. A record five consecutive La Liga wins, alongside a draw against Athletic Bilbao at San Mamés at the start of January 2011, helped the team maintain momentum in the league, finishing the 2010–11 season in 11th place. In preparation for the 2011–12 season, the club signed with Nike as supplier of the club's kits. Málaga also reached a collaboration agreement with UNESCO, which, in addition, became the principal sponsor of the club's kit. The more prominent signings of that season were the Dutchman Ruud van Nistelrooy, the ex-Lyon French midfielder, Jérémy Toulalan, and the most expensive signing in the club's history, Santi Cazorla, who arrived from Villarreal in a €21 million deal. Other less prominent players like Isco, former Spanish international midfielder Joaquín and left back Nacho Monreal, were key in the successful season which followed for Málaga. For the first time in its history, the club qualified for the Champions League after finishing the 2011–12 La Liga campaign in fourth. In their first ever participation in the Champions League, Málaga were paired with Italian giants Milan and reigning Belgian and Russian champions Anderlecht and Zenit Saint Petersburg, respectively. Malaga made it out of the group stage unbeaten, winning against all three clubs. In the round of 16, the team drew Portuguese champions Porto, losing the first away game 1–0 while winning at home 2–0, advancing to the quarter-finals. In a highly anticipated tie against German champions Borussia Dortmund, the home game ended 0–0, leaving Malagauistas with a reasonable chance to advance on the back of a draw in the away fixture. In a second leg marked by controversial referee decisions, the scoreboard showed 1–2 at the full 90 minutes mark, seemingly ensuring Málaga's place in the semi-finals, but two late goals by Marco Reus (90+1st minute) and Felipe Santana (90+3rd minute) turned the table in favour of the home team. Immediately after the elimination, club president Abdullah ben Nasser Al Thani announced a formal complaint would be filed with UEFA and FIFA. The following season, Málaga was banned by UEFA, along with other clubs for its debts, so the agency in a statement declared that the club will be excluded from a subsequent competition, for which it would otherwise qualify, in the next four seasons. However, the ban was eventually downgraded to one season and the club was excluded from the 2013–14 Europa League. In the summer of 2013, Isco was sold to Real Madrid, Joaquín to Fiorentina and midfielder Jérémy Toulalan to Monaco. The managerial position also changed, with Bernd Schuster taking over from Manuel Pellegrini. Following 2013, Málaga encountered a steady decline that would result in them finishing in a lower position in the league each year. On 19 April 2018, Málaga faced Levante U.D. hoping to end their run of 10 consecutive defeats that left them placed 20th in LaLiga. However, fate took a turn for the worse and Málaga conceded a goal to Levante’s Emmanuel Boateng in stoppage time to see the final score at 0–1. This loss meant that Málaga would be relegated to the Segunda División, ending a run of 10 consecutive seasons in the top flight. Between 1961 and 1983, the club organised its own summer tournament, the Trofeo Costa del Sol. In this first age of the tournament, the club won this competition themselves on three occasions, beating Real Madrid, Red Star Belgrade and Derby County in the finals. After a long time of inactivity from 1983 onwards, the competition was revived in 2003. Since then, the club has won the competition on five occasions, beating Newcastle United, Real Betis and Parma in the finals. All eight trophies are currently placed together in the Museo Malaguista in La Rosaleda. Updated to derby #83 played on April 25, 2017. La Liga was founded in 1929. Wikimedia Commons has media related to Málaga CF. ^ Criado, José (30 December 2016). "Málaga CF 2016: OFICIAL: Sergio Pellicer, segundo de Gato Romero - La Opinión de Málaga". La Opinión de Málaga. Retrieved 5 January 2017. ^ "Balance Sevilla-Alavés | Noticias Primera División". sevilla.eldesmarque.com. 17 December 2016. Retrieved 5 January 2017. ^ Criado, José (24 November 2016). "El Málaga CF se une a la moda del Mannequin Challenge - La Opinión de Málaga". La Opinión de Málaga. Retrieved 21 December 2016. ^ Criado, José (2 December 2016). "La Rosaleda, un estadio demasiado grande - La Opinión de Málaga". La Opinión de Málaga. Retrieved 21 December 2016. ^ "La Rosaleda Stadium". Málaga CF. 24 May 2013. ^ a b Urdiales, Antonio Fernando. "Historia del Fútbol en Málaga - Los primeros clubs". futbol.antoniourdiales.es. Retrieved 25 November 2017. ^ a b Urdiales, Antonio Fernando. "Historia del Fútbol en Málaga - El Málaga F.C." futbol.antoniourdiales.es. Retrieved 25 November 2017. ^ a b Urdiales, Antonio Fernando. "Historia del Fútbol en Málaga - El C.D. Malacitano". futbol.antoniourdiales.es. Retrieved 25 November 2017. ^ "La Rosaleda viaja en el tiempo a 1941". Málaga - Web Oficial (in Spanish). Retrieved 25 November 2017. ^ a b c Urdiales, Antonio Fernando Urdiales. "Historia del Fútbol en Málaga - El C.D. Málaga II". futbol.antoniourdiales.es. Retrieved 25 November 2017. ^ Prados Roa, Luis. "La goleada del Málaga al Real Madrid". abc (in Spanish). ^ Relaño, Alfredo (31 July 2016). "Asesinato del presidente del Málaga (1971)". AS.com (in Spanish). ^ "Historial Años 70s (Atlético Malagueño)". AREFEpedia. ^ Urdiales, Antonio Fernando. "Historia del Fútbol en Málaga - C.D. Málaga - 1972". futbol.antoniourdiales.es. ^ Urdiales, Antonio Fernando. "Historia del Fútbol en Málaga - C.D. Málaga - 1974". futbol.antoniourdiales.es. ^ Puga, Manuel. "Fallece Deusto, único 'Zamora' del CD Málaga". La opinion de Malaga. ^ a b "Historia de Málaga CF; Temporada 2002/2003". Málaga official web site. Retrieved 13 April 2013. ^ "El Jeque destituye a Jesualdo Ferreira". As.com. 2 November 2010. ^ "Manuel Pellegrini nuevo entrenador del Málaga Club de Fútbol". Málaga official web site. 4 November 2010. Archived from the original on 8 November 2010. ^ "Alta a Asenjo, Demichelis, Camacho y Julio Baptista". As.com. 28 December 2010. ^ "Málaga bate registro histórico de cinco victorias seguidas". La Opinión de Málaga. 15 May 2011. ^ "Remontada fulminante del Málaga". Malagacf.diariosur.es. Diario Sur. Retrieved 18 May 2011. ^ "Fiebre por el Málaga". Malagacf.diariosur.es. Diario Sur. 24 May 2011. ^ "Responsables de la Unesco visitan la Rosaleda". Malagacf.diariosur.es. Diario Sur. 6 June 2011. ^ "Real Madrid announce Isco signing". Goal.com. 26 June 2013. Retrieved 22 April 2014. ^ "Official: Toulalan signs for Monaco". Goal.com. 15 April 2014. Retrieved 22 April 2014. ^ "BBC Sport – Malaga name Bernd Schuster as Manuel Pellegrini's replacement". Bbc.co.uk. 14 June 2013. Retrieved 22 April 2014. This page was last edited on 21 April 2019, at 18:32 (UTC).